Back on September 2011, during an afternoon TIFF screening of all things, is when I was first introduced to Juan de los Muertos (Juan of the Dead). Juan is the first genre film to ever come out of Cuba and was developed with the support of the Cuban government. As you may have guessed by the title, Juan is most definitely a zombie comedy, and it’s one of the funniest that I’ve ever seen. Juan (Diaz de Villegas) is a hustler living in Havana who is deliriously happy to simply play out his days exerting as little effort as he can as long as he’s stocked up on food and rum. His make-shift raft is where we are first introduced to Juan and his partner in crime, Lazaro (Molina), while they are fishing and end up reeling in something a little different. Choosing not to mention this, the two make their way to Juan’s place, or should I say rooftop, where they observe the world around them through a telescope. Both men reflect on their poor parenting situations, as Lazaro’s son, California (Perugorria), has become as big a hustler as him and Juan’s daughter Camilla (Duro) wants nothing to do with him as she has recently returned to Cuba, but only on her way to Miami. Juan organizes a meeting of local hustlers: Lazaro, California, transvestite China (Vila) and his/her muscle, Primo (a hulking Ramirez), in order to discuss “business” during a town hall meeting of regular citizens who coincidentally are reporting things stolen that are the fault of Juan’s associates. The meeting is promptly crashed by a now zombified council member, deemed “American Dissident” by the Cuban media, and the zombie onslaught plays out in full force. Juan retreats to his trusted rooftop after saving Camilla and along with Lazaro, California, China, and Ramirez decide to profit from the catastrophe by starting Juan de los Muertos, where they will kill your beloved ones – for a fee. Juan’s motley crew takes to the streets, Juan with a paddle, Lazaro’s machetes, California’s baseball bat, China’s slingshot, and Primo’s fists, to start making money. The thrills, chills and abundance of laughs continue all the way through the end credits. Is there a lot of familiar territory here? Yes there is, but are there most definitely a lot of new takes on tried and true formulas along with biting social commentary mixed with innovative laughs. 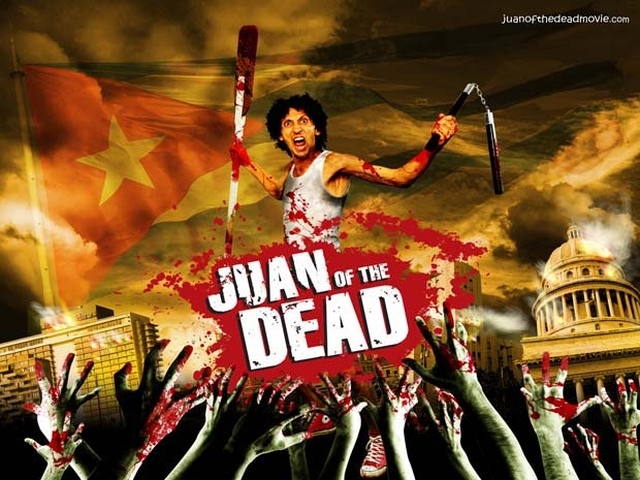 Juan of the Dead is one of the funniest and best zombie movies ever, there is said it. The cast all deliver here, from Diaz de Villegas’ ultimate anti-hero Juan and his bumbling sidekick, the hilarious Molina, to Perugorria and Duro as the kids with a budding love story, much to Juan’s dismay. The demented pair of Vila and Ramirez, as China and Primo, with China’s inappropriate comments and Primo’s hilarious aversion to blood, also add much flavour to the group. The Cuban capital of Havana becomes a supporting character as there is such a sense of environment and Cuban culture on display here, being able to film on and around major landmarks and tourist attractions really helps drive this point home. Director Brugues keeps the film paced precisely and the film is funny all the way to the end, unlike some of its predecessors it does not peter out halfway through. Juan of the Dead holds up tremendously well on the second viewing and I know why TAD head honcho Adam Lopez fought so hard to bring it to his Summer Spotlight night. Juan just missed out on my ‘best of 2011’ list by a hair and it was a difficult decision. Juan of the dead is a very strong recommend. TAD’s summer screenings run for a second night on Wednesday July 11th with the Sci-Fi/Comedy/Horror mash up Detention at 7pm and the Sundance midnight programme runaway smash hit horror anthology V/H/S. Tickets and info at the links.